I type carefully as I write this review so as not to focus on the political opinions concerning the Taliban. 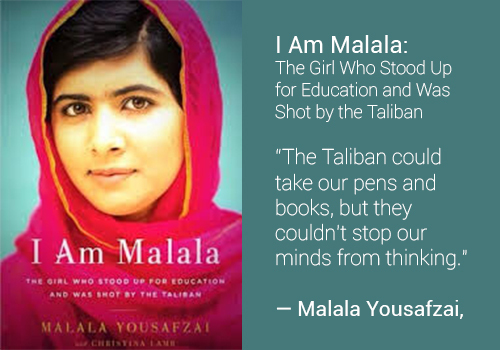 Stories like I am Malala are inspiring to me because they show us in modern times the strength of the youth. Malala was young and intelligent, she had reason to be afraid of her life yet she chose to work hard and become as well educated as possible so that she would be prepared to say the write things when the opportunity presented itself. I believe so strongly in the importance of education for all people, but especially oppressed women. Education must be the best way to improve the safety and security of those who live in such dangerous circumstances. People who speak out about their horrific experiences will always have opponents, often because the truth can be scary but also because the truth is so unbelievable. I hope my daughters have the strength of Malala but I also secretly hope they never have to use it. This entry was posted in Images and Words and tagged Book Reviews, Non Fiction.